The Election Commission is a department that has been vested with powers by the Indian Constitution. The department is placed under the charge of the Chief Election Commissioners. He is assisted by the Deputy Chief Election Commissioner to discharge his duties. Election Commission ensures that all elections take place freely. It also highlights and implements election rules, stated in the Constitution. The monthly salary of the Chief Election Commissioner of India is same as the judge of the Supreme Court. 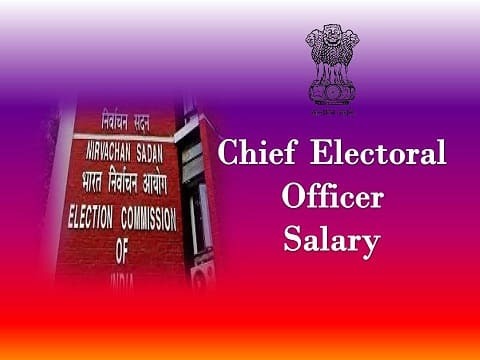 Any person, who is appointed as the Chief Election Commissioner will receive a monthly pay of Rs. 2.50 lakhs. All appointed Chief Election Commissioners get Rs. 3,000,000 on a yearly basis. This calculation has been done on the current monthly salary that a person with this designation is supposed to receive. The chief and the deputy Election Commissioners are entitled to attain several additional benefits, offered by the central government. Apart from the monthly salary, these post holders will also attain a pension after they retire from the post. The pension will be 50% of the last drawn salary. After the death of the ex- ECs, the living spouse will receive a family pension as well. During their term in the office, both Chief and Deputy Election Commissioners receive housing and transportation allowance. These individuals have cars at their disposal at all times. They have personal security and office staffs. Apart from this, they are entitled to receive medical benefits, and leisure allowance. Complementary role of chief and deputy ECs – Both the chief and the deputy election commissioners of the nation work as per the laws, highlighted in the Constitution. They are in charge of the Election Commission, and the tasks that the department undertakes. The main responsibility of the Deputy Election Commissioner is to help and advice Chief Election Commissioner in discharging his duties. Holding Presidential election – Both the chief and the deputy election commissioners have to play an important role in the election of the President of the country. Holding Parliamentary election – Holding all Parliamentary elections is another important duty of the Election Commissioners. Preparing electoral rolls – The Chief Election Commissioner must check all documents, to ensure that there are no errors in the final electoral rolls. He also highlights the duties of other officials, associated with the department. Checking the background of candidates – The Constitution has certain criteria that all electoral candidates have to fulfill, if they desire to contest in the elections. The Election Commission must check the applications, and scrutinize the backgrounds of electoral candidates. Constitutional delimitations – Demarcating the constitutions is an important task before the elections. This helps the department to take necessary actions for smooth operations before, during and after the actual polls. It is the duty of the election commissioner to demarcate these constitutions. Crafting necessary laws – It is also the responsibility of the Election Commissioners to ensure free and fair elections in every part of the country. In case stringent action is necessary, the department forms laws to ensure this practice.